The aim of our project was to build a system for physically connecting different bacteria in a predetermined manner. We have tried to design surface markers that enable bacteria to bind to each other and to respond to the binding by a mechanism that would allow us to select for bound bacteria. A succesful system would allow us to organize different types of bacteria in a culture and we have therefore named our project «The microOrganizer». A split enzyme is an enzyme split into two or more non-functional parts with intact tertiary structure. This means that the enzyme can be active if the different parts come together and assemble into the original enzyme. The enzyme parts have a natural affinity for each other and can assemble spontanously. We wanted to expose two different parts of a split enzyme on the surface of different bacteria. Wild type E.coli can express proteins on their surface by using protein channeling systems called autotransporters. These proteins assemble themselves to a channel in the bacterial membrane and any proteins connected to them will be threaded through this channel and exposed to the outside of the bacteria. The channel itself functions as a membrane anchor. We aimed to connect our split enzyme parts to the membrane part of the autotransporter and present them on the bacterial surface. The enzyme activity is an obvious marker of a succesful surface interaction between the bacteria. We therefore wanted an enzyme which substrate could induce a particular response that the product could not. The enzyme activity could protect the interacting bacteria and do the job as a selection mechanism. We chose β-galactosidase as our enzyme and β-galactosyl glycerol as our substrate. β-galactosyl glycerol is a small β-galatoside that can cross the E.coli membranes and enter the cytoplasm through a constitutively expressed galactose permease. β-galactosyl glycerol can also bind to the Lac operon repressor in the same manner as allolactose and inhibit its repressor activity – thus function as an inducer of the Lac operon. β-galactosyl glycerol also makes a potential substrate for β-galactosidase which splits β-galactosyl glycerol into glycerol and galactose1. β-galactosidase is expressed in wild type E.coli from the LacZ gene which is a part of the Lac operon. β-galactosidase can be split into two different parts with an intact tertiary structure and is therefore a good alternative for our split enzyme. The two parts are coded by what has been called LacZ α and LacZ Ω. 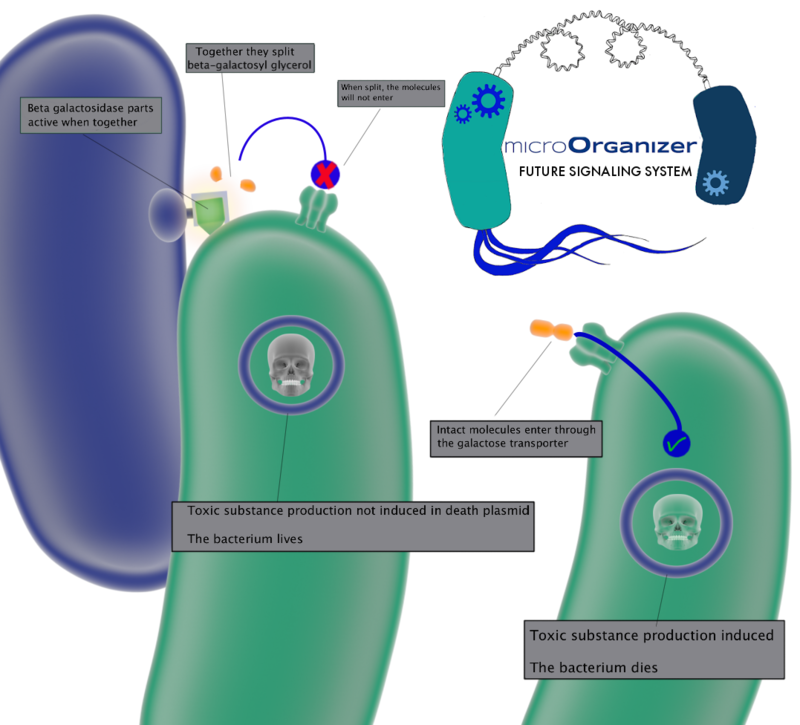 The final version of the microorganizer system would be as follows: two different strains of bacteria would express a fusion protein consisting of the membrane part of an autotransporter and one of either LacZ α or LacZ Ω. Both strains would also have a toxic gene under the control of the Lac promoter. The two strains would be mixed in a medium containing β-galactosyl glycerol. Bacteria with no partners would have β-galactosyl glycerol flowing into cytoplasma and induce transcription from the Lac promoter and kill them. Bacteria that are bound to each other through the β-galactosidase parts will cleave galactosyl glycerol into galactose and glycerol and make sure the bacteria can survive. To avoid a short cut in the mechanism we would have to use bacteria were the Lac operon is deleted so there is no cytoplasmic β-galactosyl activity. We identified a strain, E. coli NCM17, which meet this criteria. 1) Egel, R. (1988) The "lac" operon: an irrelevant paradox? Trends in Genetics 4:31.